The food bridge vzw was privileged to organize a workshop at the ongoing Tropentag 2018, as part of the African Diaspora Projects Initiative . The theme of the workshop was “Linking African Diaspora agro food entrepreneurs to research and SMEs. 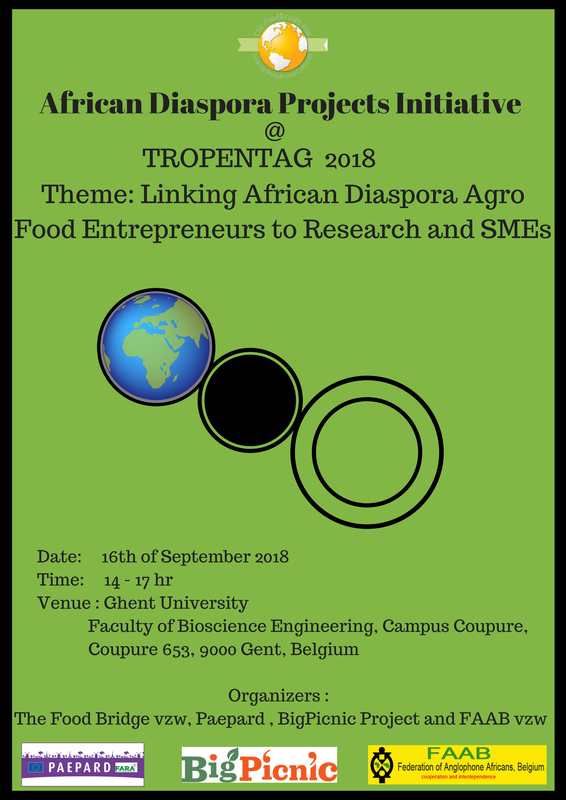 It is significant that the organizers of Tropentag 2018 gave us this opportunity because not many realize the relevance of the African Diaspora input in the agro food sector . This workshop was a follow-up to our conference at the Bouchout castle Meise Belgium on the 25th of April 2018, which focused on the African Diaspora food market and linking research to diaspora investments in food processing and other agricultural value chains. The concept of the Tropentag workshop 5 is based on the premise that African Diaspora entrepreneurship, is an overlooked opportunity for a sustainable input in the development discourse and policy making . For years the focus has been on the remittances from African Diasporas, as a constant source of economic empowerment and development in many African communities. Now a new generation of African Diaspora entrepreneurs, are taking advantage of their global interconnections for innovative projects in the agro food sector in Africa and Europe. An engaged African Diaspora entrepreneur with links to research and SMEs is an asset in the development of Africa.